On a glorious sunny afternoon, we welcomed Wells Blue School to Hugh Sexey's. We knew this would be a tough match, as Wells Blue won the match last season. We only had 11 boys fit to play; 4 of our key players were either ill or injured. Nether the less the 11 boys who played all got a full game and they did brilliantly. Hugh Sexey's went ahead first after a cool finish from George Moss, who is on fire with his goal scoring at present. Credit to Wells Blue for keeping the pressure up, Hugh Sexey's defended well, especially Goal Keeper Sam Tucker who put some great shot stopping saves. As half time approached the score was Hugh Sexey's 1: Wells Blue 0. Second Half - it was Wells who started the game better. 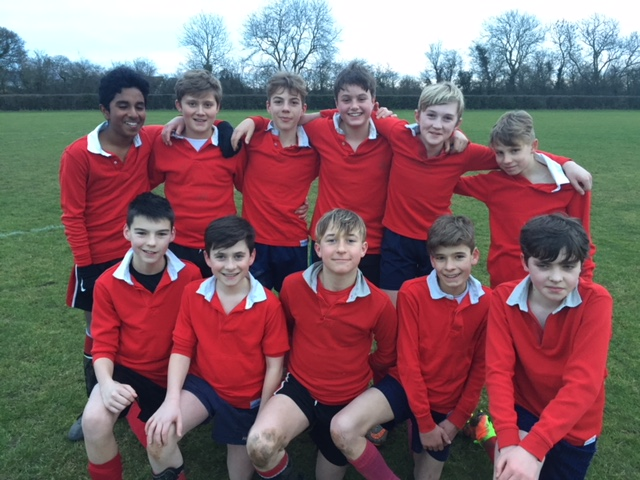 The Blue School equalised after Hugh Sexey's back 3 were caught napping, allowing their striker to creep past them and slot the ball home in the bottom corner. Hugh Sexey's never-die attitude was great; they put the ball on the center spot and started again with their heads held up high. Some great footwork skills from Nathan Radford got the ball to Fraser Bruce who then put George Moss through. George then went round the keeper to score what could be a contender for goal of the season. A great premier league finish! Wells Blue hit back at us for a short time, but some great defending and team effort from Hugh Sexey's denied them another goal. A good shot on goal was saved by Well's keeper, but he couldn't hold the ball and George Nuttycombe showed his great reading of the game, reacted to the fumble, and slotted the ball home to finish the game 3-1. It was a truly great afternoon of local schools football. Both teams were a real pleasure to referee.